We produce turnkey containers that are CNC-machined and assembled to customers’ exact specifications. We can also supply FR-3700 Series foam for customers who prefer to build their own liners for Type A and Type B nuclear containers. The product is available in densities ranging from 3 to 40 pounds per cubic foot. This material has proven to be the most effective and enduring insulating liner for nuclear material applications and for transporting extremely hazardous waste. Customers worldwide rely on the unique properties, performance, quality, and life cycle traceability of our FR-3700 series foams to protect and transport their nuclear waste. General Plastics meets such demanding quality systems as NQA-1 and MIL-I-45208A. General Plastics custom-builds protective LAST-A-FOAM® FR-3700 liners for the most common types of radioactive waste containers: drum containers, MAP-12; OPUS; Travellers; TruPact I, II, II; UX-30 containers; and impact limiters. This material is rare in mitigating both mechanical and thermal energy, and fully satisfies RAM package regulations for energy absorption and exposure to fire in accident conditions. The formulation is specially designed to allow predictable impact-absorption performance under dynamic loading. At the same time, it provides an intumescent char layer that insulates and protects hazardous materials, even when exposed to pool-fire conditions. LAST-A-FOAM® FR-3700 retains its physical properties in long-term nuclear material applications, outperforming wood and other polymeric materials. When a sample of 20-year-old LAST-A-FOAM® 3720 was irradiated and tested, there was no change in compressive strength or fire-retardant properties. Rigid, closed-cell polyurethane LAST-A-FOAM® products are highly resistant to a wide range of chemicals and solvents. Common petroleum products such as oil or gasoline have a negligible effect; exposure to liquid acids and bases does not significantly deteriorate foam properties at normal room temperatures. 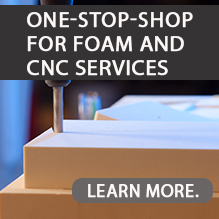 For more information on selecting or designing with LAST-A-FOAM® FR-3700 for these applications, consult our nuclear design guide or download our research paper on polyurethane foam as an impact mitigation and flame retardant material.